In this post I give examples of feedback received from those watching events unfold with BBX. I observe a trade exchange’s demise as it is happening and I use real comments (and my responses) so that you too can see what I see, reality from the inside. The key take-home is that a barter business of the traditional model, built around a privately created currency, is fatally flawed when the integrity of the owners is challenged, found wanting and then exposed. The reason for this is that money is built on trust. When the Wizard is exposed, the game is up, trust evaporates, the rats all leave the sinking ship and . . . bye bye BBX! The current situation as I write is that the BBX management are reeling from the consequences of me publishing the findings of my investigation into the Touma family business. With the founder gone and the foxes in charge of the hen-house, business has gone downhill and talk has gone uphill – “Global expansion plans” a euphamism for failed franchises. The “Touma/BBX family” a deception based on group-think and feel-good. “Vindictive, lunatic” an impossible attempt to build credibility off ad hominen attacks. “Two years solid growth” a wild hope rather measurement of actual performance. “88,000 cardholders” a marketing message that means nothing and simply fails to correlate to reality. I’d look into bbx Perth aswell big issues here for the past 2 years mark Milland held franchise he is 4 times bankrupt and has been charged with criminal offences regarding money. He has conned many if the wa members. Head office was aware of this yet brushed it under the table. Yes, thank you. Mark has a VERY long record as do others inside BBX. More on the quality aspects of the BBX personnel in due course. In regards to Head Office, well, par for the course and . . . watch this space! A trade exchange is only as strong as it’s reputation and good name and the people behind it. As a digital currency Trade dollars have a perceived value similar to shares, and as such are easily influenced by public opinion, be it good or bad. Agreed! And more stories . . . I have seen your articles on BBX and while I have not yet had a chance to read through all of them I am pleased someone is investigating these allegations from Cameron. I have been a member for approx.. 5 years and have been amazed by the disorganization and turnover of staff. I currently believe the Christchurch office has closed yet despite asking this at least three times I have yet to receive a straight answer out of them. My big ‘bug bear’ with BBX is that several years ago they ran a promotion whereby members could win one of 3 x Brand New Mercedes Benz cars, I asked a lot of questions around this: How do I enter? When is it drawn? Who won? Etc etc and have never had a straight answer. It seems they never gave any Mercedes cars away and the whole thing was a scam, I believe the Commerce Commission should know about this fraudulent tactic they have been using to strum up business. I am interested to keep abreast of your blogs and seeing how things develop, good on you asking the tough questions and investigating. I can confirm that there is “nothing” at Christchurch in NZ and I also predict that the remotely-run, part-time ‘non’-Auckland offices too will be closing very soon! I also suggest that it’s pretty easy to work out why this guy never got notified of the winner of the “3 x Brand New Mercedes Benz cars” . . . and why BBX hasn’t talked about it and won’t answer questions! I have had dealings with BBX in Perth Western Australia.I sold my boat to the state franchisee, Mark Milland. I accepted 175,000 bbx trade dollars. I was told that I would be able to use these trade dollars to buy whatever I wished. Like a mug I believed it. Nearly two years later after being rejected at almost every point I st have aprox. 167,000 trade dollars in my account. Well he said it all eh? “Like a mug!” This is the reason that I do what I do. People like this dude. OK sure he admits to being conned but BBX knew very well what was happening. There is a LOT more to come out about these shysters, I can promise you! When I talked about criminal conduct, I meant it. As you know Dennis wont let go and has put his teeth in this. So since we have a recip account in the BBX system, that we never used by the way, it seems for us at the moment the best thing to do, to have this account removed. If there will be investigation, we do not want to be involved in any way. I hope you understand this. What I understand is that the people in the industry who wrote this and jumped ship and tipped me off are some of the smartest people in the industry to do so. Note also that it is not that they had done anything wrong (they actually hadn’t used their account) it is that they didn’t want to be seen to do anything wrong or even be seen to be associated with anything wrong! IRTA is extremely concerned about the BBX situation . . . We of course are conducting our own review of the matter and will take appropriate action once we have all the facts. Of course, I bet they are VERY MUCH “extremely concerned”, especially when their Chairman talked of them as “quality” in his puff-piece after they signed up recently! 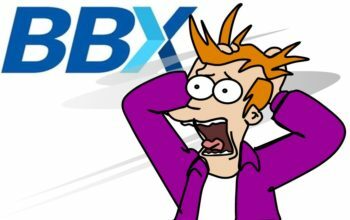 But BBX has some support out there . . . one brave soul! we [another barter trade exchange] are throwing our name behind BBX. This guy’s a lunatic. For his sake I hope he doesn’t throw anything more that his name behind BBX because if he’s put money behind BBX, then he will have lost it. As I’ve said to him in direct and online communications, I simply don’t care who someone is . . . if the whistle they blow sings to the tune of truth, then I’ll sing that very same song too! Great work on your BBX action. Of course, as the holder of about $7,800 BBX Trade$, I’m not too happy to hear this, so will follow with keen interest. I have questions about Cameron McKean. Is he himself above reproach? Is there any substance to the BBX / Touma Family’s counter-allegations? Did Cameron take any action to start up in competition, as they allege? Did he start producing a software package to that end? You see, I, a largely inactive member who only signed up because my Employer owed me money and this seemed a way to receive some value, myself received an e-mail from Cameron at BBX Thailand. This suggests that somehow, Cameron had access to the company email lists, or the system was configured in such a way that he could mass mail the members. This seems contrary to what you have reported regarding his e-mail(s). Many thanks for your prompt reply this afternoon. It appears that converting my BBX$ to anything worthwhile is near impossible. It seems there is no one wanting to sell anything worth buying, which is quite understandable. I guess I have mostly myself to blame, since I received these T$ over a year ago. I will try to get them converted into real currency by the employer in question (for whom I have not worked in the past year) though I don’t like my chances. There are credits sitting in his account but where are the associated debits? Clearly gone from the system, vamoose! This man assesses the situation as “understandable”. Well it’s only “understandable” when you apply logic onto facts. If you listen to bankrupts and crooks telling you that their BBX trade dollar has value, then you clearly DON’T understand! When everybody has credits and nobody releases anything “worthwhile” (as he says) then you have to ask where the value has gone from the exchange. The currency has been debased. It’s called inflation. The value has been pilfered by management, and almost always for personal gain. BBX will very shortly cease to exist. If you are in any way involved with the BBX brand and currency, I recommend that you watch this space. Chancellor: I have good news & bad news. The good news is: we have enough money to create a vibrant economy. The bad news is: it’s still out there in your pockets!